Matlock station was awash with admirers of the world famous film star Anna Neagle from around 10.30 in the morning of Monday 2nd July 1951 when female fans of all ages, some with small children, began to congregate in anticipation of her arrival on the 1.24 p.m. London train. According to the Matlock Mercury, the assembled crowd had swelled to several thousand by one o'clock. 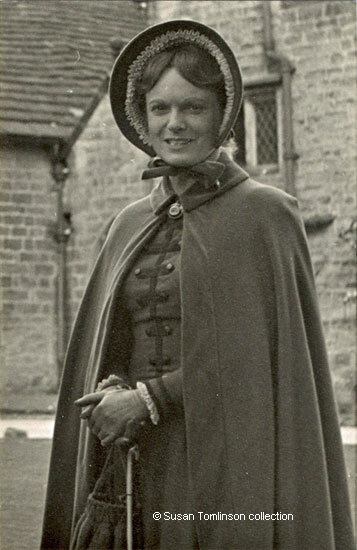 Miss Neagle, who was then playing the role of Florence Nightingale in the film "The Lady with the Lamp", was due to film scenes at Lea Hurst that re-enacted Miss Nightingale's return from the Crimean War (she had arrived unannounced, having walked from the station). "The Lady with the Lamp" was one of many movies directed by Miss Neagle's husband, Herbert Wilcox, that starred his wife and these were the final scenes to be shot. 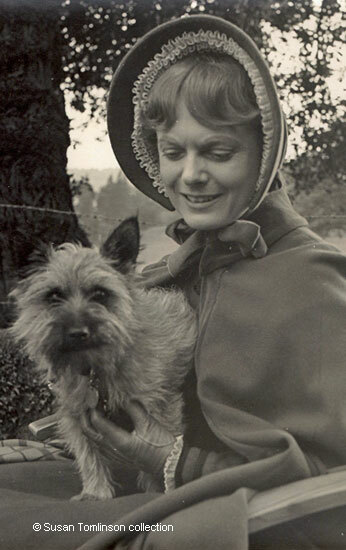 Anna Neagle was a top box-office draw in the early 1950s. Her previous roles had included playing Queen Victoria, Odette Churchill, Edith Cavell and Amy Johnson. She had made the film "Odette" not long before (1950), which perhaps explains the large number of fans at the station. Autograph hunters abounded and one fan reportedly shouted "Congratulations, Odette". The actress is said to have called out "I'm so sorry I can't speak to you all" from her car as she continued her journey to the Nightingale's former home at Holloway. On reaching Lea Hurst everyone had to wait for the weather to improve, and there were more autograph hunters waiting for Anna. Photographers, both professional and amateur, were on hand to record her obligingly posing for pictures on the balcony, on the steps and in the doorway. The stunning pictures on this page are just a few of the ones taken. She spent the night in Florence's room at Lea Hurst and the top picture shows Anna in costume, seated beside Florence's dressing table. The second day of filming coincided with the sale of Lea Hurst by Marchant Brooks at their Causeway Lane saleroom. Before the couple returned to London Herbert Wilcox apparently asked where he could buy Bakewell puddings and the Mercury staff promptly phoned the Bakewell pudding shop with an order. The specially baked puddings were made by the proprietress, Mrs. Needham, and were delivered to the station and presented to Mr. Wilcox and Miss Neagle by two young girls on behalf of the Matlock Mercury Ltd. (Matlock Mercury, 7 July 1951). 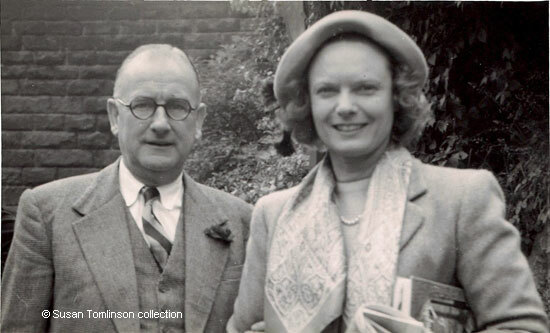 Anna Neagle and her husband Herbert Wilcox at Matlock station. 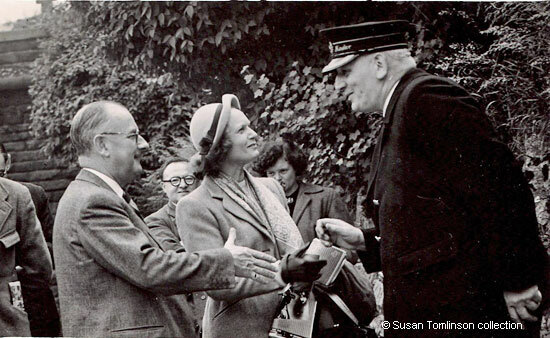 Anna Neagle and Herbert Wilcox greeted by Matlock's station master. He was wearing his gold braided "royalty" hat, according the Matlock Mercury. elsewhere on this web site. See: "One Man's Photographic Memory". 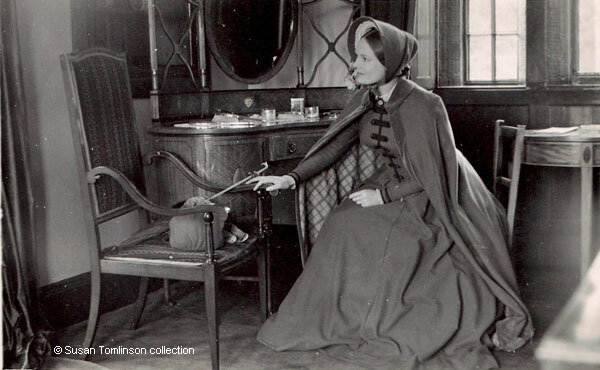 For the scenes shot at Lea Hurst Anna Neagle was dressed in a coffee coloured cloak with a velvet border and a fitted dress under which was a flounced petticoat and long pantees. The dress was fastened with Florence Nightingale's brooch, presented to her by Queen Victoria. The actress's hair was covered by an auburn wig and worn in a small bun. She wore a brown bonnet with an inner frill of lace. Similar lace can be seen around the cuffs of her dress. She carried a fringed parasol and a small reticule. On her feet were a pair kid boots, made to a design worn by Queen Victoria. Charles Limb,deep in conversation with Anna Neagle. 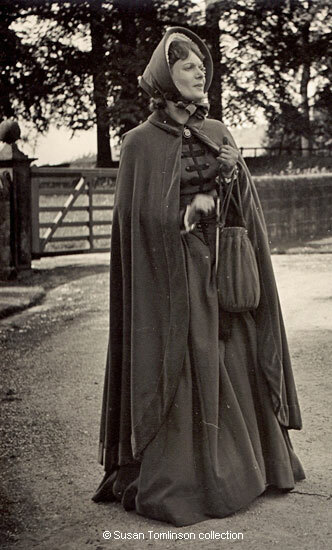 One Holloway man who took a great interest in the visit of Miss Anna Neagle to Lea Hurst is sixty-eight year old Mr. Charles Limb, the estate manager, whose cottage lies beside the Park gates. Miss Neagle listened eagerly whilst 'Charlie', as he is known to his many friends, gave his personal recollections of Miss Nightingale. As a boy he had joined parties of schoolchildren who used to visit the house to sing for her whenever she was in residence and had scrambled for the nuts and sweets she would throw down for them from the balcony outside the room in which Miss Neagle slept." Matlock Mercury, Saturday, 7 July 1951. 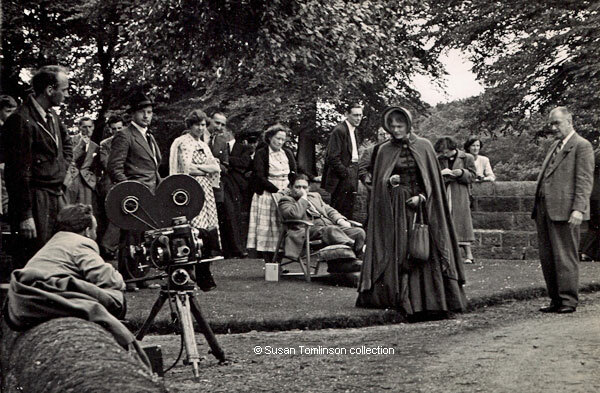 Anna Neagle and Herbert Wilcox, surrounded by the film crew, in the grounds of Lea Hurst. was a fan watching the proceedings. 1952, with the picture featuring on the page for June. Images 1, 2, 3, 4, 8 were photographed by Harry Gill. "Lea Hurst, Holloway" (bottom image), photographed by J Marchant Brooks of Bakewell and used on a calendar in 1952. All remaining photographs from an unknown photographer. 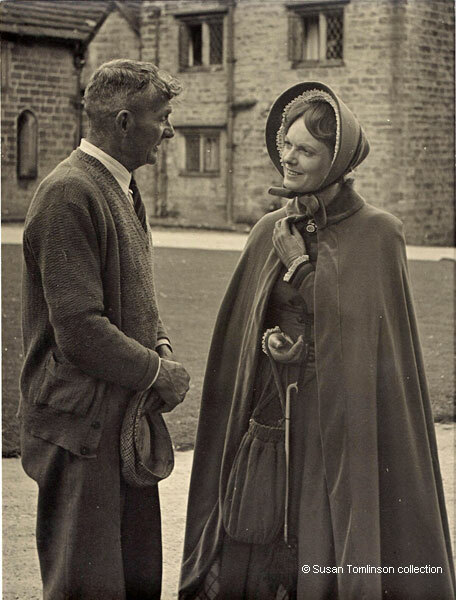 Images and Matlock Mercury articles supplied by and © Susan Tomlinson collection. Coat of Arms Description of NIGHTINGALE arms. Onsite Pedigree of NIGHTINGALE family, from Bryan's "Matlock", with additional notes. Dethick, Lea and Holloway (Kelly's 1891 Directory). Photo of Lea Hurst amongst scanned images in "Souvenir of Matlock Bath" can be seen on this site. Marchant Brooks Sale Rooms, Causeway Lane. 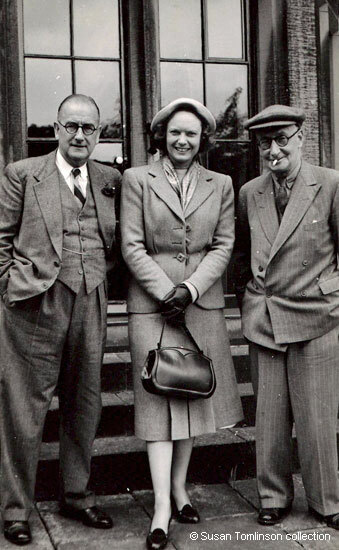 The first sale of Lea Hurst had taken place in 1946 and the second was during filming.